It hasn't been until I grew into adulthood and motherhood that I truly appreciated all of the homemade baked goods my mother made me as a child. (I can't believe I would trade my homemade chocolate chip cookies for Oreos at lunchtime!) In my mother's mind she baked because it was healthier and cheaper than the alternative. Now I understand the time it took to plan, prepare, and bake many of my childhood memories. 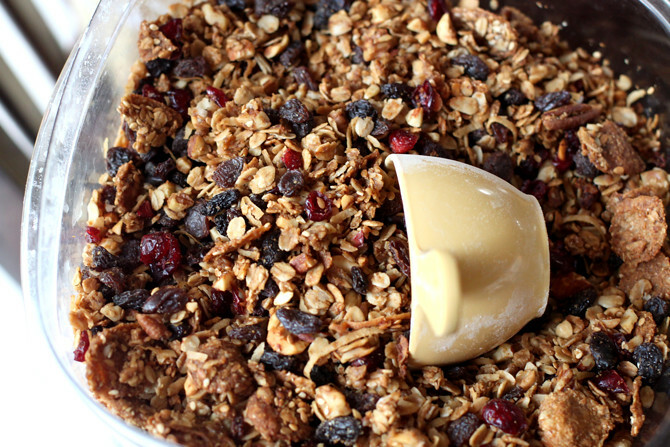 One of my favorites was her crunchy, hearty granola. It is packed with everything but the kitchen sink. 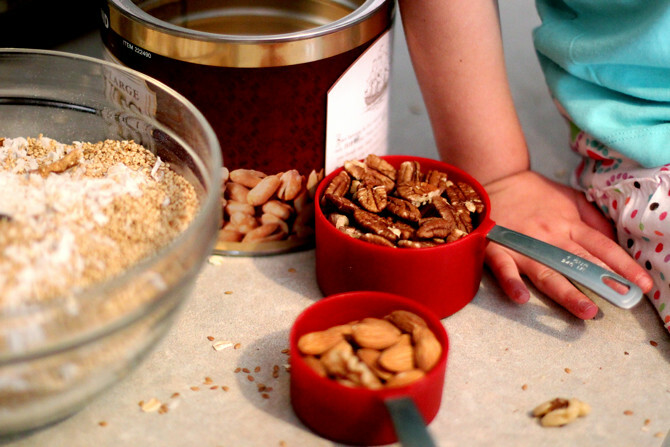 I recently introduced it to my girls, first through their helping to make it and then, with their empty bowls in hand and great anticipation the following morning. I'm happy to pass it on to you and your mornings. 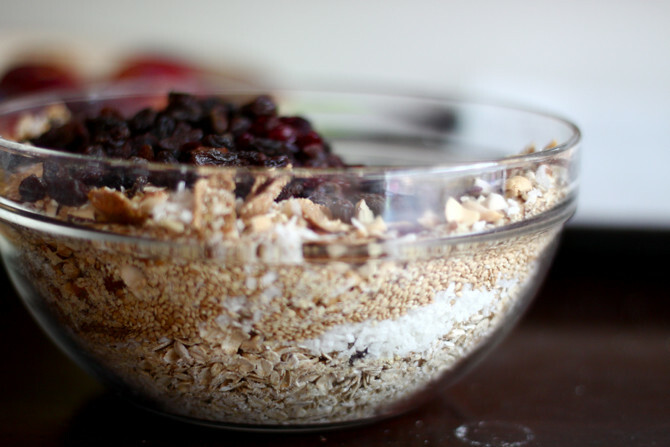 In a large bowl, combine above ingredients. Preheat oven to 300. 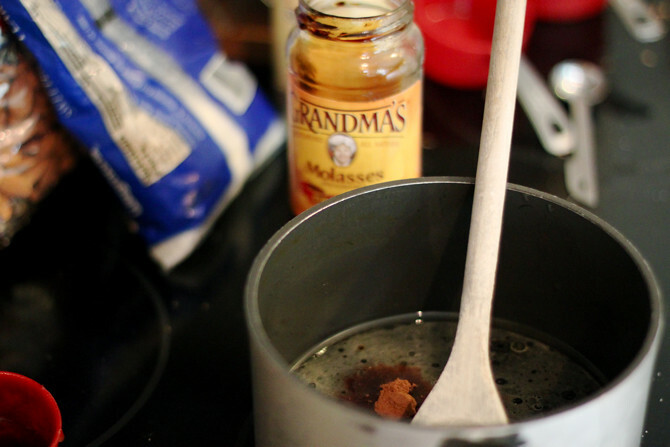 In medium saucepan, combine brown sugar, water, oil, honey, molasses, salt, cinnamon, and vanilla. Heat and stir until sugar dissolves. Do not boil. 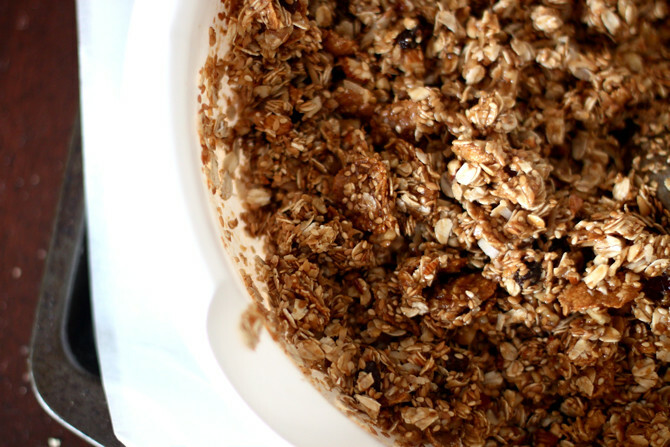 Pour syrup over oat mixture. Stir until syrup coats all ingredients. Spread mixture on 2 large baking sheets with raised sides. Bake 20-30 minutes, stirring occasionally. Bake 10 minutes longer for a crunchier texture. Cool. Stir in dried fruit. Makes about 10 cups.